In the name of Humanity and Freedom. I am Mahvash Fathi, the mother of Mohammad and Abdollah Fathi, who were recently executed at the hands of the [Iranian] regime’s executioners. In the wake of the anniversary of the mass murders of the 1980s and, in particular, June 20th and the mass executions of 1988, and the continuation of executions as late as today, I am inviting all families who have lost their loved ones – their children, spouses, brothers, and sisters – to executions to join me in a protest against these executions. I’m also asking all freedom-loving people of the world, wherever they may be, to declare June 20 – 28 as days to declare “No to Execution.” By organizing and demonstrating their opposition to execution throughout this week to condemn this inhumane act – which is government-sponsored murder, born of stone-age thoughts aimed at annihilating the opposition so they can continue with their power-hungry dictatorial rule, shameful existence, and plundering of the national wealth of whatever country they’re in charge of – I’m hoping that this act, repeated every year on its anniversary, with the aid of aware and awakened individuals, will mark the beginning of a movement and the arrival of a day when we no longer have to witness such inhumane acts, and we live, instead, in a humane world free of executions. I’m hoping for that day. 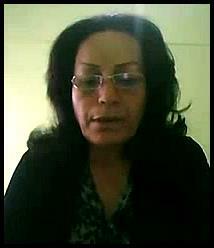 Again, this is Mahvash Fathi, the mother of Mohammad and Abdollah Fathi.